At 21, most people would be heading to university with hopes of achieving a degree, or entering the workforce to pursue a typical nine-to-five job. But for Rosa Belenguer Pomares, she opted for the more unconventional route of becoming a decoration artist at Spanish porcelain company Lladró. “I’ve always loved painting and everything related to handicrafts,” says the 46-year-old. “So when I found out about the job opportunity through a friend, I knew I wanted to do it.” But convincing her parents — who wanted her to continue her studies — to accept her decision wasn’t quite as simple, she adds. 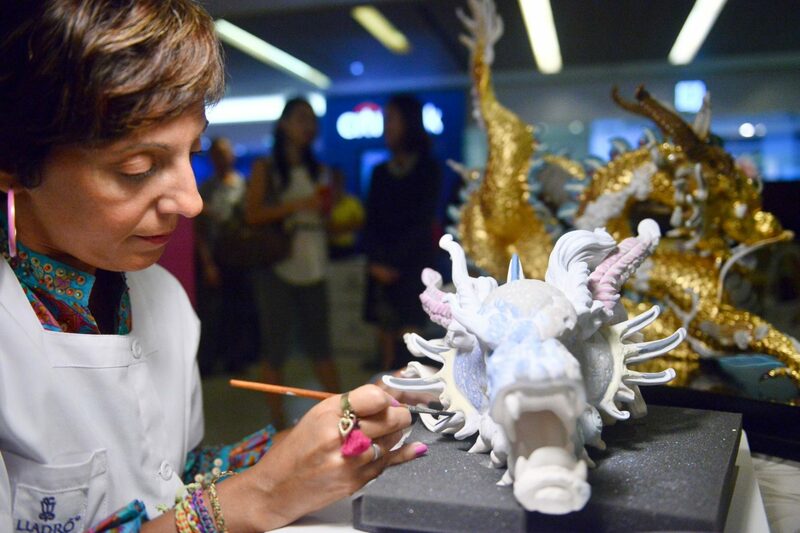 Recently in Singapore to perform a public demonstration of her painting work at Paragon, Pomares chose Lladró’s The Great Dragon — a golden dragon figurine adorned with intricate features such as whiskers, claws and scales — as her showcase piece. There, she showed the audience how the figurine is painted before it is fired in the kiln. According to her, the overall process of completing this exquisite piece is a tedious one that takes around a week. The sculpture is first coated with the necessary enamels and materials using various painting techniques. Then, it is cooked in a kiln for the colours to settle into the design, before going through a second stage of decorating where golden lustre is added for the resultant glossy effect. Despite all the complexities that go into finishing the art piece, Pomares considers The Great Dragon as one of her favourites to work on, precisely because its elaborate details demand a high level of technique and craftsmanship. “It is an exuberant work that combines the symbolism of a mythical animal with an extraordinary quality,” she says. Having spent over two decades working at Lladró — without accidentally breaking a single figurine — one would imagine that Pomares is by now an expert in handling and painting porcelain. But she is not one to rest on her laurels.